The first book, or actually novelette, of the year is Clementine, by Cherie Priest. Although I did say I was going to read 50 books in a year, I am not excluding novellas and novelettes in this. For now, short stories are not fair game, but I will be reading those throughout the year as well. Now, if I complete an entire collection of short stories, that will count. In these posts, I will not be summarizing the novels, but rather just posting my thoughts on the novel as a whole. Hopefully, as I get better at this, the posts will get longer and more interesting and involved. Clementine is a steam-punk adventure set in Priest’s Clockwork Century. I have read only 220 pages of Boneshaker, so my exposure to that world was a bit limited. However, it was enough to want to read books in this universe. I enjoyed Boneshaker while I was reading it. The library just made me return it. Clementine was an enjoyable read. It was quick, fun, and partially satisfying. And what I mean by partially satisfying is that while it was fun to read, there is not much meat on this bone. The characters of Hainey and Boyd, although intersting, don’t get much history and background to them. We never get to really know them. I would not call them flat, but they aren’t 3-dimensional characters either. We don’t know what motivates them beyond the basic plot of the novel. We don’t get to see the character as fully developed. Priest does give you enough that I would like to know more about Boyd, and maybe Hainey. 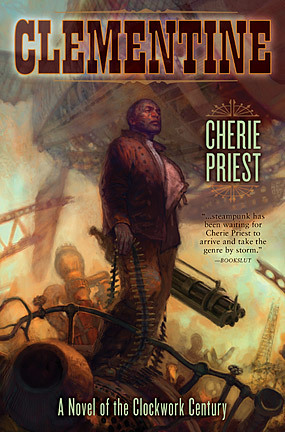 This novelette is your typical steampunk fare with dirigibles gllore. But, unlike what I have read in Boneshaker, it is nothing new. You can tell that she did not spend the time to develop her world or characters much in this novelette. This is just a story set in the Clockwork Century, but she didn’t expand that world or its characters at all. I did not learn anything new about this world with this read, and that is disappointing. It could have been much better. She didn’t add much to her own world or to the steampunk genre as a whole. This entry was posted in General, Reading, Writing and tagged alternate history, books, fantasy, reading, steampunk. cherie priest. Bookmark the permalink.